Aao Gaon Chalen project at village Kumbhari near Akola. 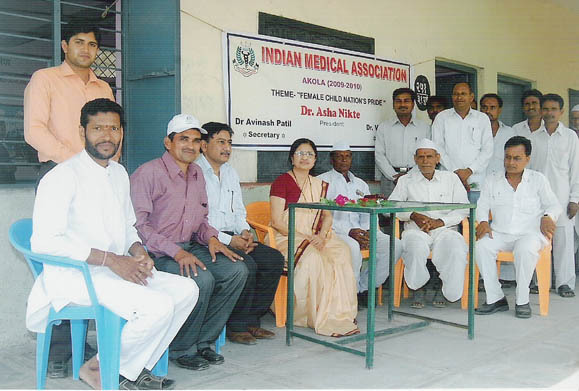 Dr Mrs Asha Nikte President Dr Avinash Patil Hon Secretary, Dr Ram Shinde along with Sarpanch Shri Sukhdevrao and others are seen at the Anaemia detection Camp Activity. 237 persons were examined for Haemoglobin estimation and Blood grouping. Average Hb. was between 7 and 10 grams. No one had Hb. above 12 gms. Poor sanitary conditions were found in the village adding to the poor health conditions in the village.